As part of The Exchange Collaborative Awards process we are offering a collaboration workshop for academic early career researchers (from Exchange partner HEIs) and creative partners who wish to submit an application for 1st February 2017 deadline. This workshop is not a compulsory part of the application process, but attending will strengthen your application, and will, we hope, be a constructive development opportunity regardless of the outcome of your application. This is a workshop designed for research partnerships, with the expectation that the academic partner and creative partner will both attend in person and work through the exercises together. You may still benefit from the workshop if one partner attends in person and the other is available for live chat via Google, Facebook or any similar social media platform. 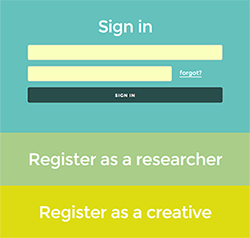 If you don’t yet have a research partner, or are not able to interact with them online in real time during the workshop session, we would recommend attending one of the webinars instead. Academic partners must be from one of our Exchange Partner HEIs. Designing a strong collaborative research project is an art in itself – but most research preparation time is typically spent on deciding what to do rather than how to collaborate. In this practical workshop, you’ll learn how to build a deeper understanding of which values are shared between partners (and which aren’t), and how to use this information to avoid common collaboration pitfalls and build partnerships that work. Our experienced facilitators will guide you through creative, interactive exercises that will change the way you design and implement any collaborative activity – not just research in the traditional sense – and transform your understanding of concepts like ‘impact’ and ‘outcomes’. You’ll learn how to develop and use values-based indicators to monitor and evaluate your activities on your own terms, right from the start. Although this workshop is designed to assist you with your application to The Exchange Collaborative Awards, it will also provide you with useful skills and resources to take forward into your research or creative practice. This workshop is brought to you in association with Fossbox.